You are here: Home » Uncategorized » TORNADO WATCH : ! CANCELED – CANCELED ! TORNADO WATCH : ! CANCELED – CANCELED ! 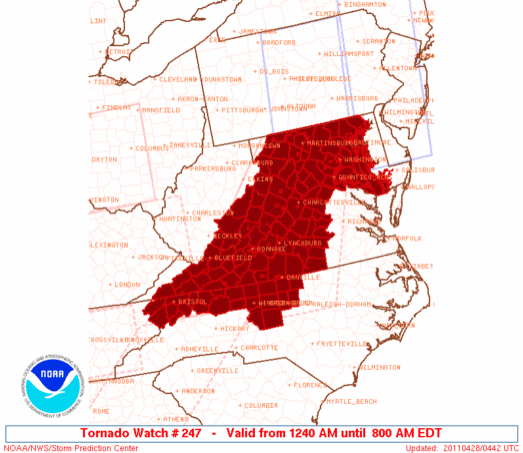 Via NWS : A new TORNADO WATCH is now in effect until 8AM EDT for all of Central Virginia including Nelon & Wintergreen. For the absolute latest watches and warnings, look to the right under Nelson Weather Alerts. !CANCELED – CANCELED – CANCELED! EFFECTIVE THIS THURSDAY MORNING FROM 1240 AM UNTIL 800 AM EDT. ASSOCIATED WATCH OUTLINE UPDATE (WOUS64 KWNS WOU7). AND MODERATELY UNSTABLE AIR MASS IN PLACE ACROSS THE PIEDMONT. TORNADO WATCH: ! Canceled – Canceled ! Nelson & Wintergreen : Tornado Watch – CANCELED ! Tornado Watch #233 – !CANCELED!